To encourage participation in our LibQUAL survey, the Zach S. Henderson Library had a drawing in which students could enter to win prizes. 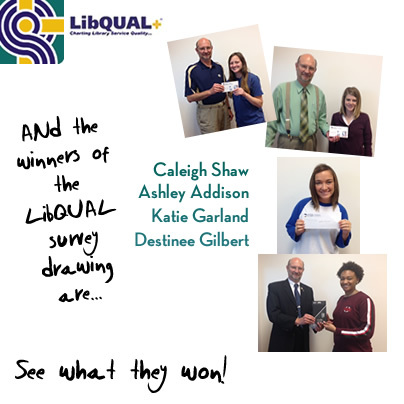 The winners of the 2016 LibQUAL Survey drawings are Destinee Gilbert, Katie Garland, Caleigh Shaw, and Ashley Addison. Ashley Addison is a Criminal Justice graduate who is currently pursuing a Masters in Sociology. She won a $15 gift certificate for Zach’s Brews. Caleigh Shaw is majoring in Writing and Linguistics, and she also won a $15 gift certificate for Zach’s Brews. Katie Garland is a sophomore in the Nursing program, and she won a $35 Eagle Dining Gift Card. Grand prize winner Destinee Gilbert is majoring in Biology. She won a Kindle e-Reader. Congratulations to all our winners, and thank you to everyone who participated!